The Arts Castle’s Castle Arts Affair and More features the work of 60 artists for sale. Many of the artists demonstrate their individual techniques and concepts to the patrons as they shop for something unique during the holidays. 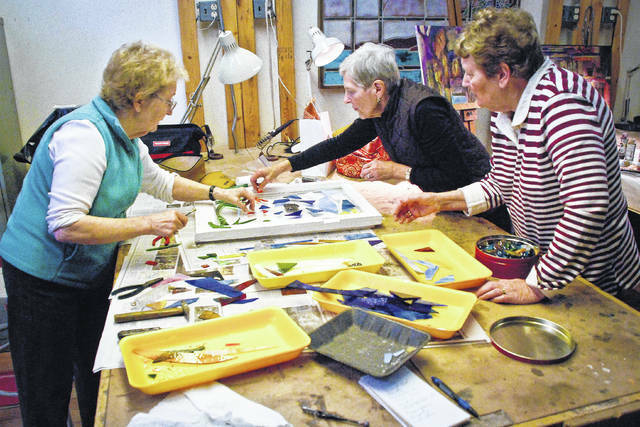 Virginia Corwin, right, is a master at cutting fine pieces of glass to create a window that can be hung in the garden. Corwin said, “it’s a great way to use an old window,” as she and Cathy Patterson, center, and Marty Stroud, left, arrange the cut pieces to create a flower garden.